« Smoked Salmon Mousse in Pâte à Choux. Sometime at the end of the month we will be having dinner guests. I rarely get guests in my house so I tend to get a little excited about pulling off the best meal ever. This is my dry run before the actual day. The house is in a right mess at the moment coz our dog is shedding his winter coat. Couldn’t come at a better time … ugh! He has been leaving tufts of fur everywhere on the carpet. No amount of brushing seems to be doing the trick. He has to be placed out on the terrace on the day of the dinner when I vaccum, otherwise all my efforts at de-furring the house will be wasted. Its getting much hotter in the house anyway these days and Doopey prefers to be out on the stone terrace with a gentle breeze to keep him cool. Anyway, in a previous entry I talked about the cold platter appetizers I was making for this dinner party. Today however, I am moving on to the dessert portion ~ Chocolate Fondant with Crème Anglaise. 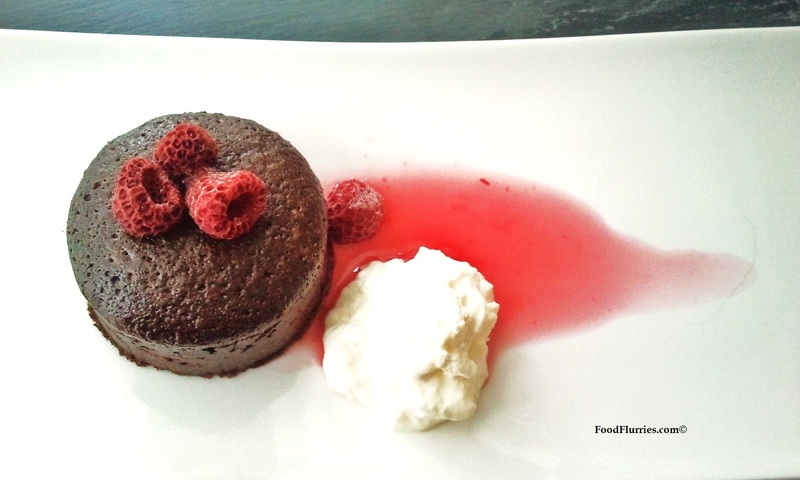 You may know chocolate fondant as soft centred chocolate lava cakes … they are one and the same. A very popular dessert that is easy to make and crops up on many restaurant menus these days. In fact, my second date with R was over chocolate lava cakes in a restaurant in Hardware Lane, Melbourne. He refused to share tho, and made me order my own portion. Humph … some date he was!! Anyway, very excited to be sharing this recipe with everyone as it will be my first ‘Hot Dessert’ entry on my blog. In my dry run photos I have plated my fondants without the crème Anglaise but it just goes to show that you can use either. 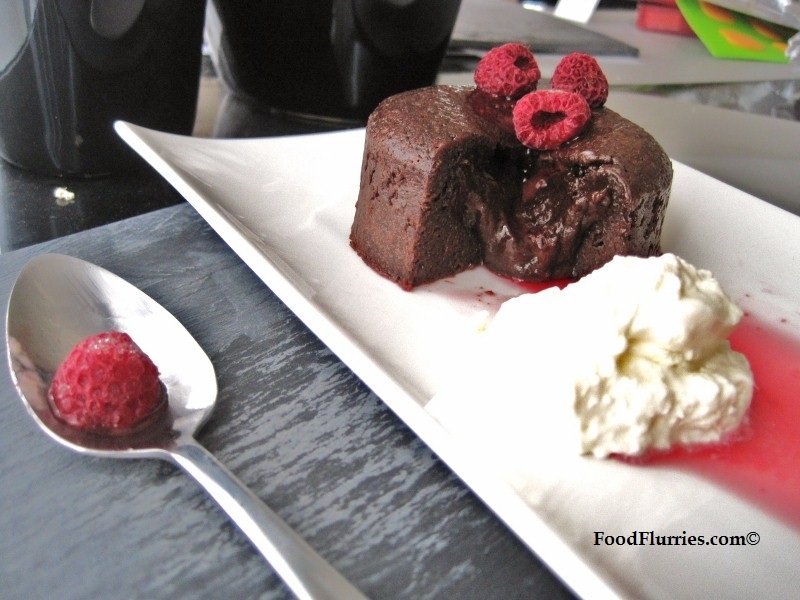 In my opinion, after making these decadent desserts in my trial run, I think a raspberry sauce would be better suited to cut the richness of this pudding. It may look like a small serve but really it is more than enough. If you still want to go the crème Anglaise route then make it runny and not overly sweet. R has been kicking up much fuss since I informed him of my decision to serve this on the day with the raspberry sauce instead of the custard. Sigh. 1. Melt chocolate and butter slowly over low heat in a bain marie (double boiler) or zap in 30 sec intervals in a microwave. 2. Whisk eggs and sugar* together until well combined, pale and fluffy (I just used a hand held electric mixer). 3. Stir both the chocolate and egg mixtures together … then add the flour … and pour everything into buttered & lightly floured moulds preferably small pudding basins. If you do not have pudding basins then do what I did and use steel cutting rings lined with a bit of parchment paper. Make sure you place the rings on top of a silicone mat or more parchment paper on a cookie sheet. 4. Bake at 190c for 10-12 minutes making sure centre is still runny. 5. Cool for 10 mins before serving. Serve with cream, vanilla custard or raspberry sauce. *Sugar ~ the recipe calls for 100 g but be aware that if you are using a less bitter chocolate like I did, then 100 g may be a bit too much. I used a 54% pure chocolate bar and I only used 50 g sugar. Here is the recipe for a runny crème Anglaise. 1. Heat the cream and milk in a saucepan. Split the vanilla pod and scrape out the the seeds. Add the seeds and the pod to the milk. DO NOT BOIL the milk … you just want it hot enough until a light steam rises off the surface and tiny frothy bubbles begin to form around the sides. 2. In a separate heatproof bowl whisk the egg yolks and sugar together. 3. Now for the important bit ~ tempering. You will need to add some of that hot milk and vanilla mixture to the yolk and sugar mixture. DO NOT POUR ALL the milk in at once or you will get scrambled eggs. Tempering means to “bring up to temperature”. So ladle a few ladlefuls into the eggs and whisk continuously. Once you have got half the milk mixed in, pour everything back onto the pot again to bring it all up to heat. 4. Let the mixture reduce a little and thicken. It does not contain any thickening agents such as cornstarch or custard powder, so it will not thicken to a gooey consistancy. This is a runny custard sauce. You have now made Crème Anglaise. Pour over many a pudding or your favourite dessert. 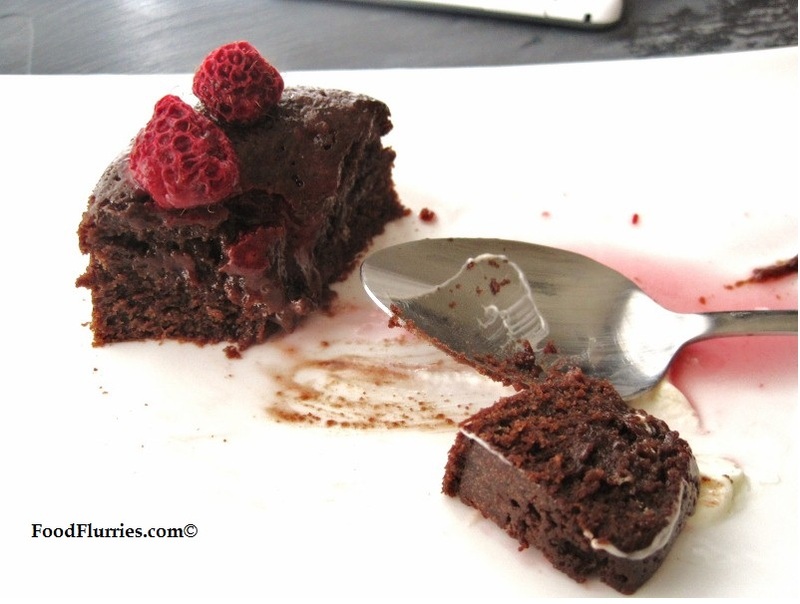 Tsk tsk tsk … chocolate fondant does NOT a dinner make, my dear. This looks so amazing, please can I come to dinner, I could never make this!! Hey Sarah!! So happy you are checking out my blog. :)) Well Tom can make the roast dinner, and I will settle dessert. Or simply come for tea and we can just eat cake. Okay, you may not approve, but my go-to method of preventing skin on custards is to brush a stick of butter over the surface while it’s still hot so I get a thin layer of butter over the custard. Me and cling wrap don’t get along so well, so I avoid it when I can. Thanks for your top tip! I never would have thought butter would produce the same skinless pudding results. Great article. I’ve enjoyed this contribution. Its nice to see every question answered in a blog post like this. I will add this post on my blog and link to it. Thanks for a clear informative post, I’ve learned a lot. I hope to see videos though as I can be A.D.D and reading articles is not my favorite thing to do online. So what I do sometimes is just print the whole thing and read offline. Thanks for the suggestion. Yeah, I would love to have videos to accompany my blog entries, I think it would appeal to a wider audience. I’m not there yet but it’s a work in progress. Thanks for stopping by.